Our online Performance-based Hiring workshop is designed for sourcers, recruiters and hiring managers of all levels who want to understand what it takes to hire top talent on a consistent basis. You'll be able to leverage your investment in LinkedIn Recruiter to prequalify and source top tier talent using our "Small Batch, High Touch" process. 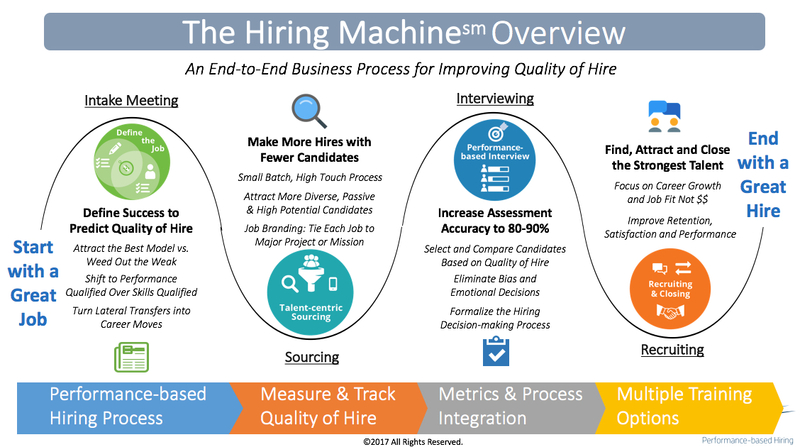 The infographic below provides a quick overview of the training and the impact it can have on improving quality of hire and recruiter productivity. Investment: A full-year of training and access to our complete online suite of tools is just $1250. This includes access to Lou Adler’s new “The Hiring Machine.” This self-paced learning platform is a great supplement to the online course. Don’t hesitate to contact us for group rates and to learn more about our customized onsite training programs and implementation packages. 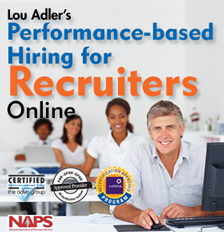 Your full year of coaching, Performance-based Hiring certification, and 24/7 Resource Portal access starts with Performance-based Hiring for Recruiters Online! The challenges facing recruiters are increasing at a rapid pace. Performance-based Hiring for Recruiters and Hiring Managers will help you meet these new challenges head-on by providing the latest tools, techniques, and ideas on what it takes to hire top people. 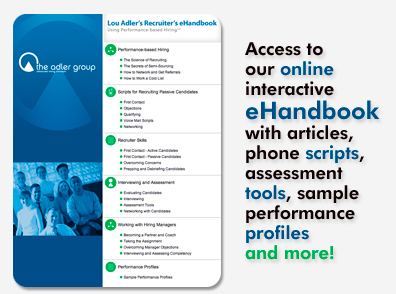 Performance-based Hiring for Recruiters and Hiring Managers Online covers the same content that is taught in the onsite workshops, but is delivered in a convenient live-online format. Attendees are connected to our expert trainers and other students via a conference line or VOIP connection, as well as a virtual classroom. Our live-online classes have all the interactivity of in-person training, but from the convenience of your desktop. Performance-based Hiring for Recruiters is taught in four distinct modules that take you through every step of the hiring process. Knowing the job is a critical aspect of being an expert recruiter. How recruiters take the assignment and the questions they ask determine the likelihood of finding a top person quickly. This module provides recruiters the tools they need to move hiring managers away from the use of arbitrary and traditional job descriptions toward the use of performance profiles. The objective of the sourcing process we advocate is based on finding the best candidates available at the lowest cost in the shortest period of time. However, passive candidates, and even the best active candidates, use different techniques when looking for new career opportunities. How they look and the criteria they use to decide to apply must be considered when designing sourcing programs for these more discriminating top performers. In this module recruiters learn how to set up multi-level sourcing programs to increase the number of top performers applying. The focus is on job-branding, networking, and leveraging the employee referral program to attract the best passive candidates around. Becoming a partner in the hiring process requires recruiters to be better interviewers than their clients. It starts by knowing the job. Using our highly regarded performance-based selection process, recruiters quickly learn how to accurately assess competency, motivation, and job fit. Our all-in-one question interview is a more flexible form of behavioral interviewing that can more accurately predict on-the-job success. But this is only the start. The interview is more than an assessment tool. Recruiters learn to use the interview to overcome hiring manager and candidate concerns, recruit candidates at each step, and negotiate offers incrementally. Using an interview this way is what recruiting the best requires. 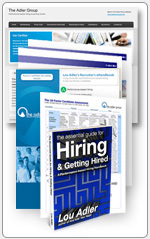 Hiring the best requires exceptional solution selling skills. Too many managers and recruiters wait until the end of the hiring process to recruit candidates and negotiate offers, or use old-fashioned transactional selling to close the deal. This results in too many candidates lost along the way or paying unnecessary salary premiums for those eventually hired. In this module recruiters learn how to professionally overcome concerns and put together compensation packages fair to all parties involved. Top people will offset compensation increases for jobs offering more growth. Creating these career-making opportunities is an essential skill for all top recruiters. Everyone who attends a live or Performance-based Hiring for Recruiters training program is automatically enrolled in our Performance-based Hiring recruiting community. All members receive 24/7 access to an online Resource Portal, access to The Hiring Machine our enhanced self-paced learning platform, plus personal coaching to become Performance-based Hiring certified. In addition, members can attend any online Performance-based Hiring Recruiter workshop throughout their year of membership. We also have special low renewal rates for alumni of Performance-based Hiring for Recruiters. Why take Performance-based Hiring Training for Recruiters and Hiring Managers? What’s the difference between the Online and On-site classes? Both Online and On-site classes deliver the same Performance-based Hiring for Recruiters content - but the delivery method changes. Each format offers exercises and breakout sessions that are unique to that learning environment. Both classes are highly interactive. Online attendees are connected to our expert trainers and other students via a conference line or VOIP connection, as well as a virtual classroom. These classes have all the interactivity of in-person training, but from the convenience of your desktop. Both classes offer the same level of coaching, the same opportunity to become Performance-based Hiring Certified, the same Resource Portal, and the same level of additional tools, resources, and benefits.